We Need Diverse Books VP for Outreach Miranda Paul shows off her next picture book, due out in May. I’ve been traveling a lot lately, mostly between Albany and New York City, and my journeys this weekend allowed me to attend two separate events that involved activists with #WeNeedDiverseBooks. 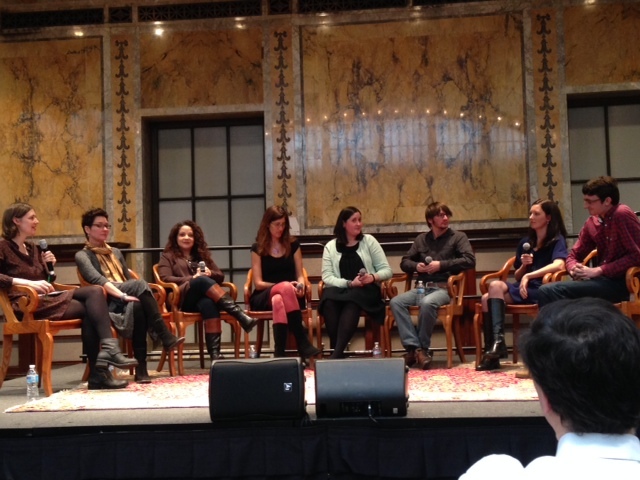 First up, on Saturday afternoon, was the Teen Author Festival in New York City. A series of panels at the New York Public Library’s Bartos Forum, 42nd St. Library included one on representation that drew a full house. Moderated by Teen Author Festival organizer David Levithan, the panel featured Maria E. Andreu, Coe Booth, Sona Charaipotra, Dhionelle Clayton, Ilene Wong Gregorio, Adam Silvera, and Andrew Smith. #WNDB co-founder Gregorio, Clayton, and Charaipotra proudly wore their badges and buttons from this organization that has grown exponentially in visibility and influence since its founding last spring. Diversity and representation panel at the Teen Author Festival, from left: Andrew Smith, Maria E. Andreu, Dhionelle Clayton, Sona Charaipotra, I.W. Gregorio, Coe Booth, Adam Silvera. 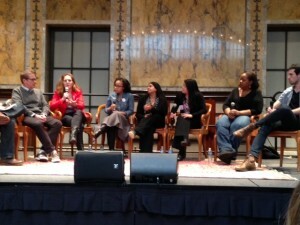 Moderator David Levithan was cut off on the left. After the panelists introduced themselves and their most recent books, Gregorio, author of None of the Above, answered the question about “write what you know,” with the memorable line, “rather than ‘write what you know,’ know what you write.” Silvera, whose recent novel More Happy Than Not features a Puerto Rican protagonist who is also gay, expressed concern about the insistence that he “represent” his community—whether that community be Puerto Rican or LGBTQIA. He reminded us that “one person can’t represent an entire community.” Booth, author of Tyrell, Kendra, Bronxwood, and most recently the middle grade novel Kinda Like Brothers, added that one person representing all members of a community tends to be more of a problem with diverse authors in large part because so few books by and about people of color and other diverse peoples are being published. 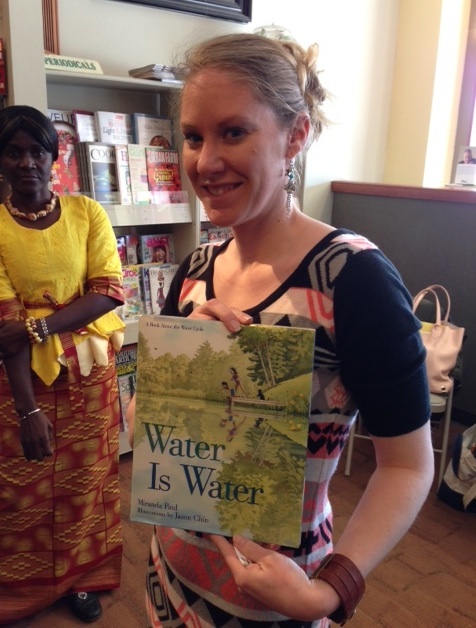 This is the problem that We Need Diverse Books seeks to address. Another reality exemplified by Silvera and his work that is part of the WNDB mission is intersectionality—individuals and characters who combine two or more types of diversity as part of their identity. Publishers tend to avoid these kinds of books, and reviewers tend to slam them, because they “contain too many issues.” (Yes, it appears that our reality is the mainstream’s “issue.”) Silvera is gay and Puerto Rican. I have encountered the same pushback with my protagonist of Rogue, who has high-functioning autism and a Latina mother. Gregorio talked about making her intersex protagonist of None of the Above white rather than Asian American because she didn’t want her book dismissed for having too many issues. I appreciate her courageous statement, her admission that even activists for change feel constrained by the powers that be. 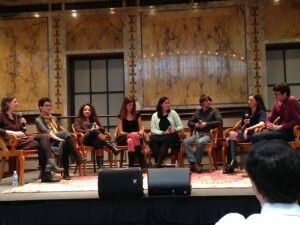 The love and identity panel that featured WNDB’er Cindy L. Rodriguez (3rd from left). I did get the back of David Levithan’s head into this one. At the same time, entire books with aspects of diversity tend to get reduced to that one aspect as a kind of literary “one drop” rule. Smith said that his very complex Grasshopper Jungle often gets described as a “gay book.” Sona pointed out another problem with that kind of reductionism—it prevents new books from getting published if publishers feel they already have their “Asian book”—a problem she encountered with three separate publishers when her agent circulated her first novel. Andreu, on the other hand, expressed concern about getting pigeonholed as a “diverse” author and not having the freedom to write anything else. After the success of her debut, The Secret Side of Empty, about an undocumented teenager from Argentina, she wanted to feature a minor character from that novel, an Anglo girl, in her follow-up. The need for more choices of topic and approach was echoed by Charaipotra and Clayton, who describe their latest YA novel, Tiny Pretty Things, as a “guilty pleasure,” much like the light series titles (e.g. Sweet Valley High) that they grew up with but in which they failed to see themselves. 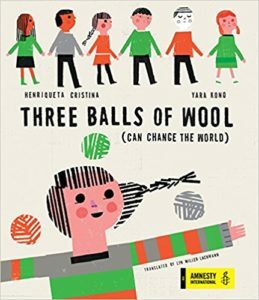 Not every book with diverse characters needs to be deep, serious, and sad. We also need light books and books in a variety of genres. The final question for the panelists addressed “what we want.” The suggestions included not making whiteness as the default, portraying more diversity within diversity (this touches on the topic of intersectionality), and not making the story “all about” diversity. Those who recommend the books to teens should not simply funnel diverse books to readers that share the same background. These are books for all readers. 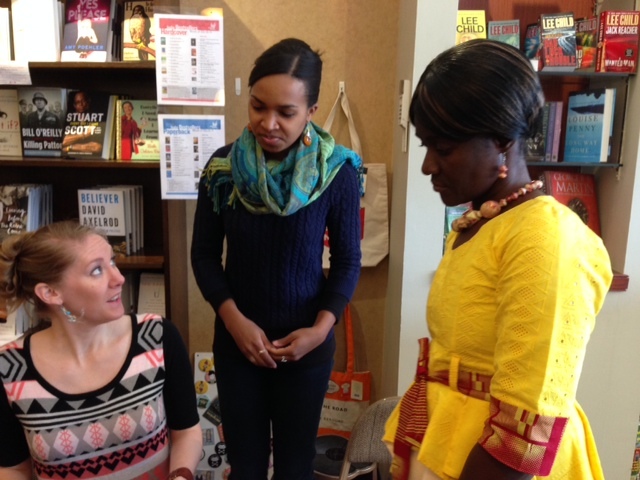 The three creators of One Plastic Bag, from left: Miranda Paul, Liz Zunon, and Isatou Ceesay. After two later panels—one of which featured WNDB team member Cindy L. Rodriguez, author of When Reason Breaks, who spoke about love and identity—I rode a bus back to Albany. 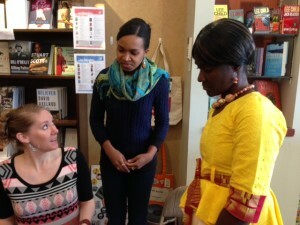 This afternoon, WNDB Vice-President for Outreach Miranda Paul joined the co-creators of One Plastic Bag: Isatou Ceesay and the Recycling Women of the Gambia, Elizabeth Zunon and Isatou Ceesay, in a signing at The Book House. 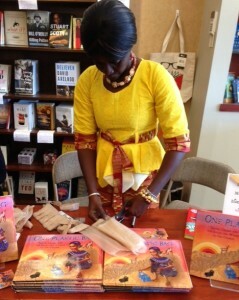 Isatou Ceesay demonstrates how she cuts the plastic bag to make one continuous strand, first folding the bag and making straight cuts, leaving about an inch uncut at the end. One Plastic Bag highlights Ceesay’s work recycling the plastic bags that, instead of being a convenience in her Gambian village, had become a danger. After seeing an increase in mosquito-borne illnesses (the discarded bags collected standing water) and deaths of goats from swallowing the bags, Ceesay collected them, washed them, and wove them into items that were sold to help the village. Paul talked about efforts to ban the plastic bags (which have gained traction in Europe but less so in the United States), and Ceesay demonstrated how she cut the bags to make one continuous strand of plastic that can be woven. After making straight cuts, she cuts diagonally, from the uncut end. The video of her cutting the bags is available on YouTube, where it has over 250,000 viewers. Additional suggestions for recycling plastic bags into useful objects are available at www.oneplasticbag.com. 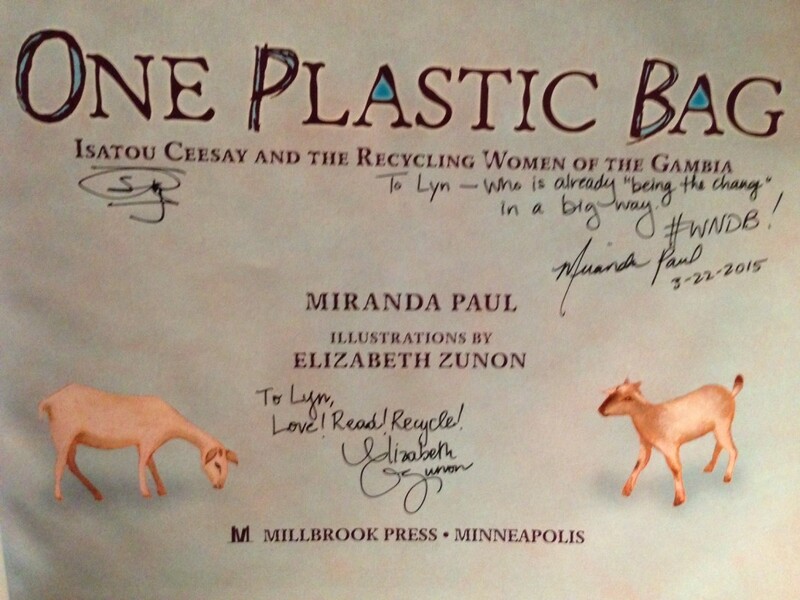 After waiting for the book to be published, and listing to Liz present on how she researched and created the illustrations, I now have my signed copy of One Plastic Bag—and a lot of things to think and write about after yesterday’s meaty panel. Sounds like a great weekend! I’m glad you were able to attend, Lyn. I am too. 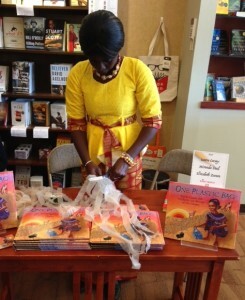 You would have really enjoyed the One Plastic Bag presentation because you could make those items out of plastic bags. When I tried to cut the plastic bag into a continuous strand, I ended up with confetti.